"Two posts featuring a utility vest in one week!?" Thank you for all your support on yesterday's collaboration post with American Eagle. I am beyond blessed to have met so many wonderfully talented women, partner with brands I have long respected, find new shops & learn about my own personal style through this blog, but none of it would be possible without YOU. So I am sending you all a big hug & a kiss on the lips... yup pucker up, it's extra sloppy! This is the last installment of our Southern Blog Society Style collaboration - hope you enjoyed! I love that vest, as well as the dress. Great styling! Congrats on the feature! That's awesome!! Love how you layered with the vest, so pretty! I really actually like, which is surprising to me, the back of this dress! Also I SWEAR by Nine West shoes.... SWEAR! Love the utility vest over a summer dress. Definitely one of the easiest ways to do a little summer layering without being too warm! I love military-inspired vests over flowy sundresses, so naturally I'm dying to recreate this look! I love the dress layered with the vest! And no shame wearing the same piece twice in one week. Been there! this is so exquisitely styled! I love the vest with the brown belt! This is perfect for summer! Love how you styled the dress. Super cute. i love love love this cuff!!! Such a cute look on you! Love that we did vests over our dresses! And I love how you belted yours! So fun! Loving how you styled that dress! I'm still mad I didn't buy that vest when it was available at Old Navy! 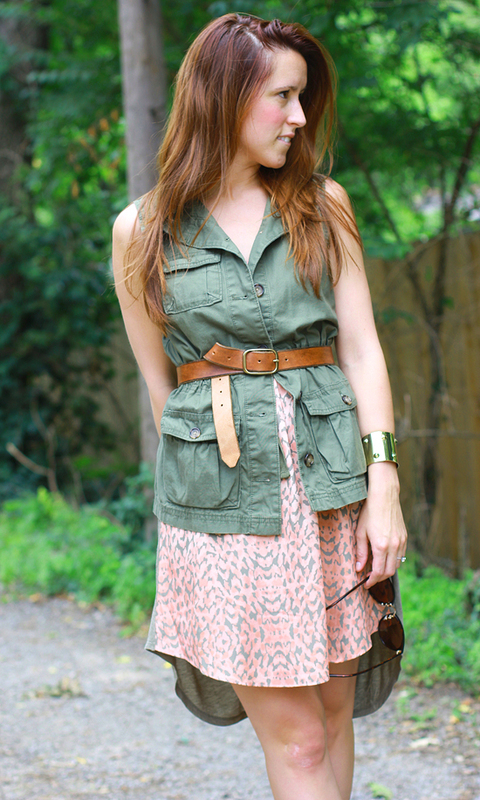 I love the utility vest and masculine belt on top of your ladylike Summer dress! This is a great look. LOVE this vest so much! So keep wearing it ;) ANd I love it with this dress! that dress is amazing!!! you are adorable! I love all the neutral tones in your outfit, super pretty! girl, I applaud you for any kind of layering in this sticky weather!! That dress is gorgeous! Utility vests are great! Yes, I was a little surprised to see two posts with it but you're just highlighting its versatility! i always love that vest and wish i owned it! such a cute outfit! and congrats on the feature! Love this layered look! I need to use my vests more often and will need to copy this. Thank you for the inspiration.